Seeking The Truth: Who Is Allah? One of the common questions that Non-Muslims asked is that who is Allah? Is He a male or female? Allah means, in Arabic, the one and only universal God or Creator and Provider of the universe. Notice here I am emphasizing “the one and only.” So a Muslim would not simply say, “There is one God.” That would not be as accurate or as strong an expression as saying ‘the one and only God’. 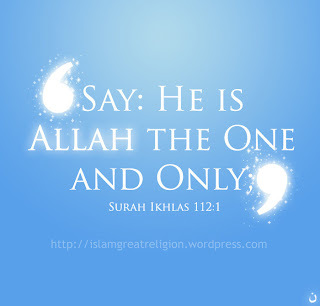 "Say, "He is Allah , [who is] One, Allah , the Eternal Refuge. He neither begets nor is born, Nor is there to Him any equivalent." Prophet Muhammad's father’s name was Abdullah (The slave of Allah). This name was common among Arab pagans and Jews. Abdullah bin Salam was one of the first Jews to convert to Islam in Medina. When Arabs call Allah in prayer they say: “Ya Allah” or “Allahoma”. Aren't these words familiar to you? “Alleluia” and “Elohim” are the words used to call Allah in the Bible.